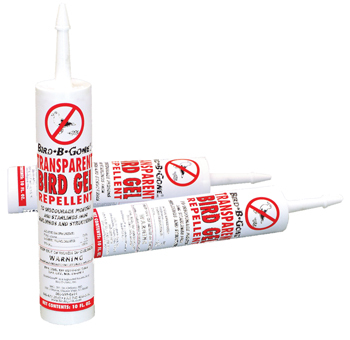 Transparent Bird Gel is a sticky gel used to keep birds off of horizontal surfaces. Birds cannot stand the sticky sensation on their feet and will move on to a more comfortable perch. Each 10 oz tubes covers approximately 10 linear feet and is easily applied using a standard caulking gun. Transparent bird gel is non-toxic to humans, animals and/or other wildlife. This product will not harm the birds in any way. Keeps birds from landing and defecating. Non-toxic to birds, animals or people.